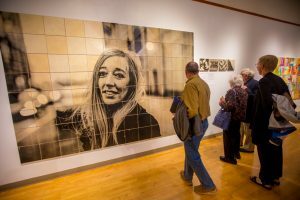 Exhibited in the Margaret Martin Gehman Gallery during Homecoming and Family Weekend, Oct. 13-15, 2017, “10x10x100” featured five artists and their 100 new works, each measuring 10 by 10 inches. 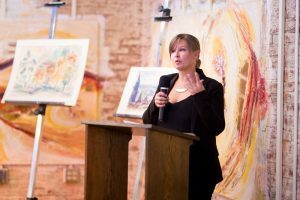 Curator Ashley Sauder Miller ‘03 speaks during the exhibit reception on Friday evening. At the opening reception, Centennial Committee chair Louise Hostetter ‘79 welcomed two honored guests. Professor Emerita Margaret Martin Gehman was the university’s first female graduate to earn a doctorate — in art education in 1962. Esther Augsburger was the college’s first graduate with an art degree, and became an advocate for the arts at EMU and for Christian art worldwide. The campus features two of her installations: Guns into Plowshares, recently relocated to EMU from Washington D.C., and Love Essence, near the seminary. 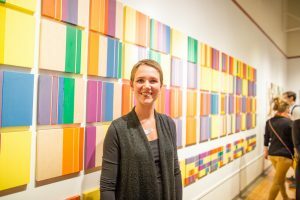 In her thanks to the committee for including the arts in the weekend, curator Ashley Sauder Miller ‘03 noted how artists embody EMU’s “Serving, Leading, Transforming” Centennial theme. Read more about each artist here. The artists — Barbara Gautcher, Rachel Herr ‘04, Zachary Nafziger ‘01, and Melinda Steffy ‘03, along with Miller— each selected a specific focus to express in a unique medium. 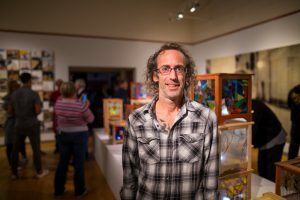 Zachary Nafziger stands near his stained glass work. Miller used mixed media — from paints to graphite to embroidery floss to donated materials from EMU’s facilities management, and more — to image chairs on campus or shown in historic photos. 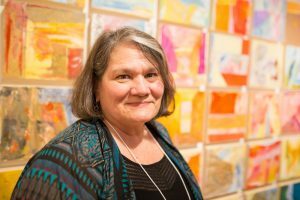 Four-part church singing is less about being perfect than about being present and participating, Steffy said, and following the opening ceremony, she led exhibit attendees gathered around her paintings in singing the hymn. Steffy’s work — specifically her inclusion of imperfection — left at least one visitor “in awe.” Valerie Lane, who with her husband Darren was on campus visiting their daughter Michaela, a first-year student in the visual and communication arts program, said finding EMU was a “God thing.” The arts education at EMU, she said, is broader than would be offered at a traditional art school. Twenty percent of sales from the exhibit were donated to the EMU arts program.